We offer a complete range of water treatment equipment and systems including vessels, media, and media exchange services to handle ongoing water treatment operations. TIGG has 40 years of experience designing and fabricating liquid phase wastewater reclamation systems for use in industrial processing and municipal water treatment. TIGG’s activated carbon wastewater systems allow industries to meet environmental effluent requirements and discharge directly to POTWs or permitted surface waters. In some cases TIGG’s systems are used to recycle wastewater for non-potable water applications to lessen demand on local water resources. By reducing or eliminating organic and/or inorganic compounds through the use of filtration and adsorption equipment, wastewater can be recycled and used for such applications as making steam, watering crops, washing municipal vehicles, and many other applications. Wastewater treatment systems and filtration systems can utilize a variety of media such as granular activated carbon, organo-clay, sand, and gravel in equipment such as multimedia filtration units, pressure filters, and other ancillary equipment as part of an integrated treatment system. 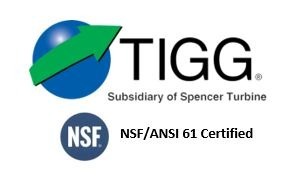 TIGG offers other treatment services including rental programs and carbon exchange services. TIGG has an experienced staff to work with consultants, engineering firms, remediation contractors, municipalities, and end-users to meet their specific environmental effluent goals. For more information about TIGG’s Wastewater Treatment Systems, call 1-724-703-3020 or click here to contact us. A municipal wastewater facility in New Jersey is reusing treated wastewater to replace the city water in various unit process applications in its treatment plant. For this project, TIGG manufactured two skid-mounted dual bed granular activated carbon dechlorination systems with integrated valve racks. Each system consists of two 6 feet diameter 150 psi carbon beds designed to treat a flow of 100 gpm. A 10-valve pipe rack allows lead/lag operation. TIGG was contacted to supply carbon for reducing aquatic toxicity in wastewater from a manufacturing plant in Southwest Arkansas. The facility wanted to pump permitted wastewater to a surface discharge; however, there was trace contamination, which affected biomarker testing. A consultant hired by the facility to investigate several methods of treatment determined that carbon adsorption was the most cost-effective approach. A pilot test was conducted with TIGG’s CANSORB rental equipment and showed effective treatment of the water. A system was ultimately installed with two CANSORB vessels in series where the units are operated in a lead-lag fashion and spent vessels are exchanged off-site. This operation has been effectively treating water for more than six years.An accordion content area. TIGG provided a two-tank liquid phase system to serve as pre-filters for water being heated to generate steam at the Hawaiian Electric plant on the island of Oahu. The water that is being used by Hawaiian Electric Company is actually wastewater that has already been treated by the sewerage plant before being discharged. Hawaiian Electric has a direct line coming from the sewerage plant to their facility. The activated carbon filtration system is used as an additional filter to help prolong the life of the demineralizer before steam is produced. Hawaiian Electric, with help from TIGG, switched from drinking water to recycled wastewater in an effort to go ‘green’, while alleviating pressures on the municipal drinking water plant.